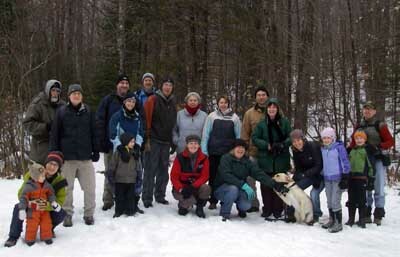 First Day Hike; January 1, 2012. 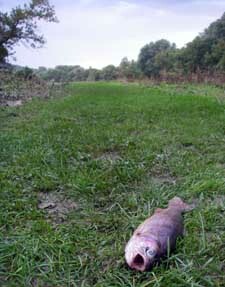 2011 turned out to be quite a year for trails, as it was for many people. The historic floods of both May and August directly impacted our trail. Most of the trail was reopened by Fall 2011, and in 2012 we will be working to not only finish repairs, but to improve all existing sections of trail to be more sustainable as well as more inviting to users. 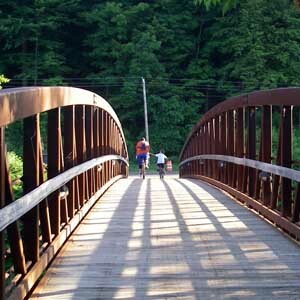 In addition, we are working together with interested land owners to establish right of way for many miles new trail at locations across the state, including what will be a watershed project in the history of the Cross Vermont Trail, a new 200 foot bridge over the Winooski River in East Montpelier. Residents of all towns through which the trail route passes are invited to get involved in the CVTA. Right now we are seeking to establish an active membership in every town. Contact us anytime to learn more. 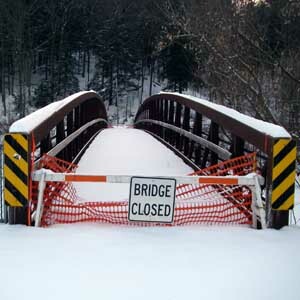 Bridge posted closed on Montpelier Bike Path. after repair by City of Montpelier. Oops, back the other way again. WESTBOUND: stay on Taylor Street, using the sidewalk on the historic truss bridge over the Winooski, then follow the sidewalk along Memorial Drive west to where it rejoins the bike path. EASTBOUND: where the bikepath turns away from Memorial Drive onto the (closed) bridge, stay straight on the sidewalk beside Memorial Drive, to the Taylor Street bridge and back onto the Cross Vermont route. UPDATE June 2012: And indeed the bridge is repaired, open again, and looks great! 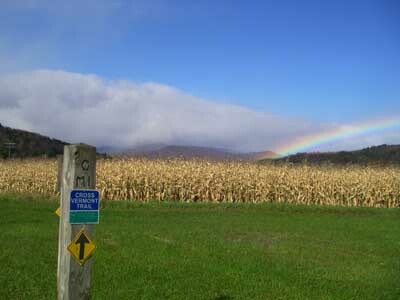 99.9% of the Cross Vermont Trail route is now open again. The trail behind state office complex in Waterbury is officially open to the public as of the end of October. A bridge has been replaced over Johnnie Brook in Richmond, opening the Johnnie Brook Trail. We are planning additional work in the coming year to make permanent repairs, and to upgrade some sections of trail to be more accommodating of future heavy rains. back into place on Johnnie Brook Trail. The trail in Groton State Forest is confirmed OK. The route on town roads in Marshfield (including along the railbed east of Bemis Farm Rd) is confirmed OK.
Volunteer work parties underway to reopen closed trail! Check here for more dates as scheduled, or give us a call. The historic flooding of May 2011, and now hurricane Irene, have impacted the route of the Cross Vermont Trail in numerous places. Here is the latest information we have. If you have updated information to pass along, please call or email us. Information is listed East to West. First for trails, then for roads. All other roads along the Cross Vermont Trail route are open as of 8/30/2011. However, there is flood impact all along the route, so stay alert for repair work in progress, and for posted notices of current conditions.